The structural difference between triumph and tragedy. Historical narrative fiction, especially war drama, often seeks to find meaning in events that at times can seem meaningless. By employing proper story structure strategies, writers can find success in communicating a message that both enlightens and pays respect to those who sacrificed it all. 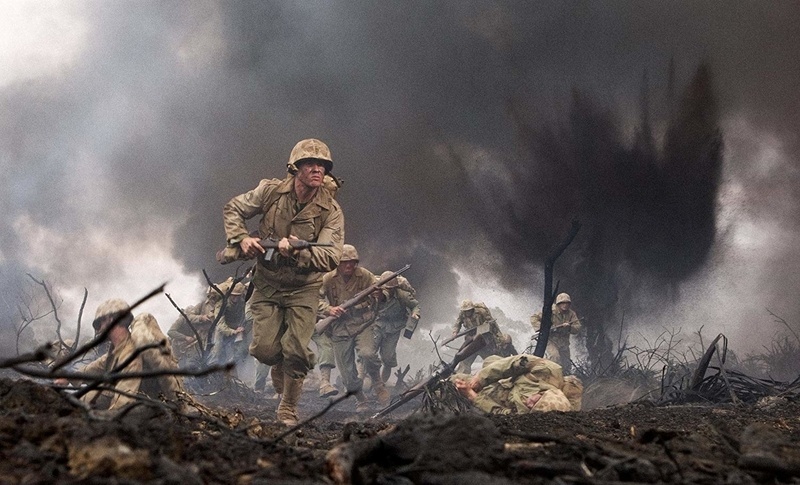 Watching The Pacific marathon on HBO this past Memorial Day weekend, it became clear the major difference between the latest WWII miniseries from Spielberg and Hanks and their first go-round, Band of Brothers. While many may cite the disjointed storytelling of The Pacific as a basis for claiming it inferior to Band of Brothers, the real reason for the disharmony between the two lies within the type of story each was trying to tell. One was decidedly up, the other was almost certainly a downer. In matters of real life, audiences are more receptive of the former, often steering clear of the latter if they can. Feature films are singular attempts at meaning. They are evaluated on their own as an audience can receive the writer’s original message without any greater context. The miniseries is an entirely different animal. In order to completely understand the writer’s original intent, critical judgment must be put on hold until every episode has played out. One wouldn’t analyze a film after only seeing forty percent of it, and thus should avoid analyzing a ten-part series by only watching the first four episodes. Understanding cannot come from an incomplete message. Sometimes though, there can be individual episodes within a series that can stand on their own as a complete story. The X-Files was well known for this with their “monster” shows. These were episodes that had nothing to do with the over-arching alien conspiracy mythos that propelled that series for nine years. An audience member could conceivably sit down, and without having watched a single minute before, enjoy a well-told and complete story. Milagro is a good example of this kind of episode. In Band of Brothers, there was definitely one, maybe two, episodes that could be considered stand-alone episodes. In particular “Bastogne”, the episode that focused on the medic as the Main Character, told a complete story in less than an hour. As the man responsible for fixing up the wounded on the front-line, medic Roe (Shane Taylor) has developed a defensive technique that distances himself emotionally from his fellow soldier. Through his interactions with the nurse Renee, Roe eventually grows to a point where he can allow the men in, even calling one of them by his first name. It’s a beautiful story that satisfies the need for on-screen warfare, while also fulfilling an audience’s need for emotional growth. It works on its own, and is often the one episode people return to when they want to revisit the European front. The Pacific, unfortunately, did not find time to do this. Unfortunate in that detours of storytelling like this allow an audience a breather within the larger scope of the series, while at the same time bringing in more audience members who might have missed an episode or two. If there was any major complaint to be had about the series, this lack of at least one standalone episode would be it (something I was really hoping for way back in September of 2009, when I linked to The Best Band of Brothers episode). Another significant difference between the two series lies with something that was beyond the control of the writers—the two theaters of war were vastly unalike. The road to Berlin was a very linear undertaking, starting with Normandy and ending on Hitler’s doorstep. In contrast, the war against the Japanese Empire was full of starts and stops, fall backs and huge leaps forward. There was no set discernable path, and this is where The Pacific had trouble holding on to its primary audience: men. Male audiences empathize more easily with linear experiences than they do with holistic experiences. They would much rather experience a journey with discernible signposts and clear demonstrable benchmarks that lead towards an eventual outcome. This is where Band of Brothers shines and why many prefer this series over the latest. Its intended audience finds greater harmony with the presentation. The Pacific, on the other hand, sought to provide an audience with an experience of this theater in its entirety. This involved short reprises in Australia and war bond drives in America. It involved more women and focused on the relationships back home and abroad that the men developed. Because of this approach, the writers lost a large portion of its audience after only four short episodes. The linearity of the journey was not as clear as it had been with Band of Brothers. But when it comes right down to it, the greatest difference between these two miniseries was the meaning of their individual endings. Referencing last year’s series on Meaningful Endings, one can determine the author’s original intent of a piece of narrative fiction by comparing where the Main Character ends up emotionally with the logistical outcome of the main story line. If the good guys win and the Main Character goes home happy, the story can be labeled a Triumph. If on the other hand, the good guys win and the Main Character goes home distraught, the story is a Personal Tragedy. If the good guys lose and the Main Character is left resolved, the story is a Personal Triumph. And finally, good guys lose and Main Character remains troubled, the story is a Tragedy. Both series ended with the good guys winning, which of course, was historically accurate. But when it came to the Main Character storylines, the two couldn’t be more different. In Band of Brothers, the Main Character of the series was Maj. Richard D. Winters (Damian Lewis). Through ten episodes we witness the struggles and concerns of a commanding officer, made even more personal through his interactions with his closest friend, Captain Lewis Nixon (Ron Livingston). At the end, Winters returns home scarred, but has resolved any major personal issues he may have had with the job he did. Band of Brothers was a Triumph story—the good guys won and the Main Character returned home happy. In The Pacific, the Main Character of the series was Eugene B. Sledge (Joseph Mazzello). There were two other primary characters who received ample screentime, Robert Leckie and John Basilone, but when taken as a whole these feel more like sub-stories rather than the main feature. Sledge’s descent into madness was the key storyline of the series. Sledge’s concern, as voiced by his father, was living through the war with his soul intact. Starting with the landing on Peleliu, the horror of war slowly chips away at his humanity. Furthering this fall is the mortarman he develops a significant relationship with, Merriel “Snafu” Shelton (Rami Malek). As a veteran of previous engagements, Snafu has developed his own way of dealing with the madness among the coral—he has learned to embrace life without a soul. The emotional argument then, as presented by this series, comes down to which one of them will eventually adopt the other’s perspective. In the end, it is Sledge who holds on to that last sliver of compassion in his heart. Regardless of the personal victory though, he still returns home shattered. Unable to find work anywhere with the job skills he acquired overseas, Sledge finds himself lost and confused; a broken man. The Pacific was a Personal Tragedy story—although the good guys won, the Main Character returned home broken and lost. This was the main reason people preferred Band of Brothers over The Pacific; the experience was more uplifting. Both series place us on a winning team, but only one provides that emotional resolution. There is nothing inherently wrong with either structure, in fact some prefer the closer-to-real life experience of the Personal Tragedy. Whether it was the lack of standalone episodes, the non-linearity approach of the plot, or the lack of emotional resolution in the Main Character’s storyline, The Pacific falls short of gaining the universal love Band of Brothers enjoyed. Structure has an impact on how a story is received. It’s not just a set of rules designed to get writers past the studio readers. There is meaning to be had with how the parts of a story are arranged and writers should be aware of the impact the order of events and juxtaposition of outcomes has on an audience. One must not look any further than the titles of these two miniseries in order to understand the vast differences between the two. Band of Brothers focused more on the deep emotional bonds these men developed under intense fighting conditions. The camaraderie was a key component. The Pacific, on the other hand, was all about experiencing that very different theater of war. Here, the environment’s toil on the human condition was the centerpiece. The madness of fighting for small islands that in reality could have been skipped over is a key point in the overall purpose of the series. In presenting the emotional reality of war, The Pacific took the greater risk. It may have turned off more audience members than it had intended, but in the end should be commended for its brave betrayal of one man’s attempt to maintain his humanity. Not every victory comes with emotional fulfillment.